Kiran Gidda, born and raised in West London, is a self-taught photographer, specialising in portraits and fashion. It started only as a hobby and a career in photography was only a dream, but after proving to her parents, through building a portfolio, that this was possible, she delved in head first and here she is today. Kiran takes advantage of natural lighting whenever she can, you would never guess that they were taking in the often cloudy-city of London. A predominant feature of Kiran’s work are bright colours and inspiration comes from friends who she has genuine connections with and who she often shoots. Having shot artists such as Ella Mai and Yxng Bane, as well as being published on Billboard, Nylon and more, Kiran has been able to progress and build her portfolio up rapidly. 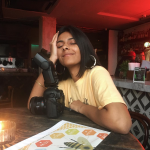 Recently branching out into shooting live music and events, Kiran plans to improve on her concert photography skills, hoping to one day work closely with music artists.